Harold is still on the phone, one candidate got 498 votes, another over 2000 and Madge got 3600 votes, she won with an overall majority! Everyone is very happy, Eddie decides that there should be a party, Helen goes to phone everyone. 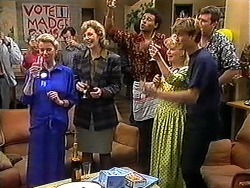 Des and Mike arrive to congratulate Madge and they immediately head to the laundry. 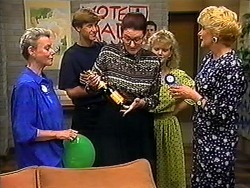 Madge tells Helen she can't believe she won; Helen tells her that she always knew she would. Madge says she now has to start thinking about all the issues such as the refuge and road safety. 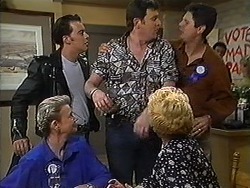 Joe is a bit drunk and wonders how Harold will feel being the partner of a councillor; Harold says he will be just fine. Harold asks Eddie and Sharon to make some food. Joe says he always knew Madge would win and tells everyone Madge is going to give him loads of work now she has been elected! 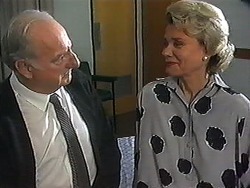 Des tells Mike that he wishes he has a date as Joe gets up to hassle Madge about work, he compliments Madge and puts his arm round her, Madge looks a bit scared. Dorothy then arrives and asks if Madge won, Madge thinks Dorothy is here to complain about the noise but instead she has arrived to give Madge some French Champagne! Des is eating all the food and Harold isn't happy. Dorothy is giving Madge advice about being a councillor, she doesn't seem too willing to take it though, she still wants to save the Jack Ramsay Memorial Fountain, Dorothy tells her it's too late. 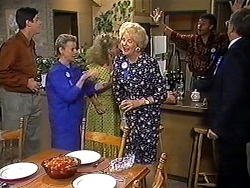 Ryan is talking to Sharon about being expelled and says it's good, Sharon is not so sure; Dorothy comes over to remove the Champagne from Ryan. RYAN: I'm 17 for crying out loud! Beverly is now here who congratulates Madge, Helen comes over and Beverly wants to know if Jim has been in touch, he hasn't. Harold makes making a toast to Madge who thanks everyone for their help and support. Everyone has now left and Madge is sat in her dressing gown in the dark, Harold comes out to join her, Madge can't sleep and has tidied up. Madge thinks Harold would be a better councillor than her, Harold thinks that's wrong and says she will be just fine. Madge says she will need Harold every step of the way and they hug. Ryan wants Sharon to skip school but she refuses, Sharon thinks Ryan should study as does Eddie. 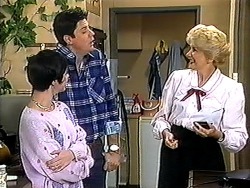 Dorothy arrives and sends Ryan home to study and Sharon off to school. Beverly says she doesn't want to talk to Jim right now, she regrets storming out of the Guidance Councillor's session. Beverly asks Helen if she thinks Jim will take her back as she thinks there is a way of sorting it out. Joe, Kerry and Madge are discussing the election, Joe hints again about looking after the parks. Kerry tells Joe that Madge can't just employ him because he's family and he should leave her alone! 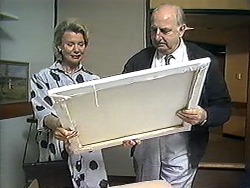 Helen shows Derek the painting she has done of his old house, Derek wants to go there sometime. Helen tells him that she knows he is dying; Derek doesn't want any pity and wants friendship. Ewan is here and Beverly tells him that she can't marry him because she has to try again with Jim. 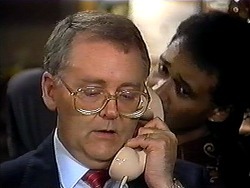 Ewan tries to change her mind but Beverly says nothing will. 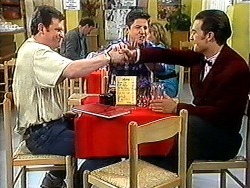 Joe and Matt are having a drink; Des arrives and says Matt looks smart; he is still a Bell Boy. Matt and Des are saying they need some romance and Joe says they should count themselves lucky that they are bachelors! He tells them to go out and find some girls, Matt and Des think that this is a good idea. Ewan says there will always be a place for her in Perth, he goes to hug her but Beverly pulls away. Ewan gets in his car and drives away, Beverly looks upset. 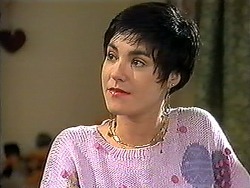 Helen tells Derek that she admires him because he has come to terms with his illness so well. Derek is happy because he has his memories, his family and his friends, he says Helen should keep the Arthur Lancing painting he gave her but Helen doesn't want to as it's very expensive. 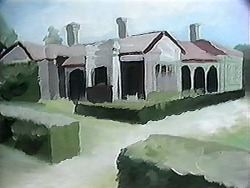 They agree that she can keep it but only if Derek can have the painting of his old house that Helen is doing. 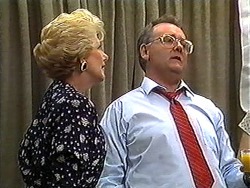 Dorothy and Sharon arrive but Ryan has gone out and Dorothy doesn't know where he is, Sharon tells her she should be nicer to Ryan and call a truce. Beverly confirms that Kerry is pregnant! She then tells Kerry that she is pregnant also! Beverly says that it isn't ideal as she and Jim aren't together.